Their Chardonnay plots are in the Grand Crus of Chouilly and Oiry in the Côte des Blancs and their Pinot Noir Premier Cru vineyards are in Avenay, Val d’Or, Mareuil-sur-Aÿ, and Bisseuil. Each plot is vinified separately, and both glass lined stainless steel and ceramic tanks are used although the ceramics are being slowly phased out. Their first wines were made in 1964, and since 1987 Jean-Paul Hébrart has been running the show, having taken over for his father Marc. They make 5800 cases and are Pinot Noir dominated wines. Since I mentioned their wines are "intellectually interesting" (no doubt a term I stole from someone else), Hebrart has been experimenting with indigenous yeasts and barrel fermentation with some of his older vines. In 2004 he bottled an alternative vintage wine named Rive Gauche-Rive Droite for the sites on opposite sides of the Marne River that comprise the blend - a fantastic wine, see below. They make four Non Vintage wines, the Brut Selection which is 65% Pinot Noir and 35% Chardonnay (sometimes called Blue Label or "Old Blue"), the 'Cuvee de Reserve' Brut which is 80% Pinot give or take, the rest Chardonnay (Green Label), a lovely Blanc de Blancs (tasting note below), and a Rose which is a pretty and elegant wine and barely 50% Pinot Noir. Their vintage wine is the Champagne Special Club Millesime, the current vintage as of this writing being 2006. Older vintages may not say "Special Club" on the label and for example my 2004s have it on a sticker. As written a few of paragraphs above, they have started experimenting with some special vintage bottlings (e.g. Rive Gauche-Rive Droite). A very light straw yellow color ("dilute piss" someone said, to be honest), with lots of bubbles. It had a head almost like a beer when first poured. The nose has light fresh bread, green apple, and a hint of orange. Sweet and succulent on the palate. Juicy apple. Creamy and warm. As it warms, it has an orange citrus feeling on the midrange. This stuff rocks. 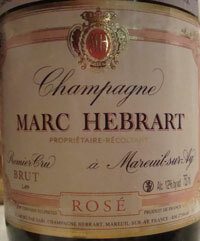 Tasting Note: Marc Hebrart Rose Premier Cru - Novemeber 2011- 93 points and I'm feeling stingy. Very light pink with a stream of fine bubbles. The nose has delicate light red fruits and some minerals. On the palate this is extremely creamy, delicate but not light, with strawberries and minerals. Sweetish but perfectly balanced. Outstanding. I'm getting me more 'o this juice! Barely 50% Pinot Noir and the rest Chardonnay. I tasted the two wines below side by side in April 2012. Fascinating, and very different wines. Brief notes as it was at a party, not a wine geek event. Made from hand selected grapes from old vine parcels on both sides of the Marne River that are fermented and aged in 205 liter four year old barriques on their lees without battonage, the stirring of the lees (dead yeast cells and other precipitate). Nose: Serious minerals, peppermint, wow! On the palate it is super smooth and silky. Vanilla, a bit sweet, a long finish. A "Wow!" wine. Nose: light fluffy bread, minerals, a little of the peppermint the Rive Gauche-Rive Droite above had but I doubt I would have singled it out without having the bottles side by side. Slightly sweet with attractive apple. 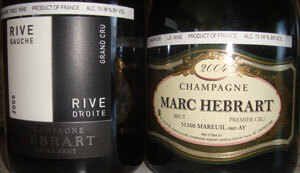 This showed well but I think would have shown much better if not drank side by side with the Rive Gauche-Rive Droite.